Poland has been the most populous country and biggest economy joining the EU in the 2004 “big bang” enlargement. Polish citizens confirmed their will to join the Union in a referendum in June 2003. Although it was clear most Poles would support membership to meet legal thresholds, turnout had to surpass 50%. In the end, 59% of voters showed up on referendum day, with 77% supporting EU membership. Poland’s subsequent membership was widely noticed across the EU, given the number of Poles that made use of their newly gained right of freedom of movement to seek work abroad, especially in the UK, Germany, Ireland and Sweden. As of 2007, Poland has also been a member of the Schengen area. Moreover, the country hosts one of the better-known and increasingly relevant EU agencies: the European Border and Coast Guard Agency, Frontex, in Warsaw. Poland reached a milestone among the EU’s ‘‘new’’ member states in 2014, when former Prime Minister Donald Tusk was elected as President of the European Council. Poland is the EU’s fifth largest EU country in terms of population, representing 8.5% of all EU citizens (without the UK). For this year’s European Parliament (EP) elections, the country will send 52 members of parliament (MEPs), 7.4% of the total expected number of MEPs (705). Despite the current government’s Eurosceptic stance, most Poles (70%) consider Poland’s membership in the EU as positive, while just 6% perceive it in a negative way. This is above the EU average (62/11) and likely connected to the economic benefits EU membership has brought to Polish citizens. At the height of the migration crisis in 2017, an IBRIS poll showed that the majority of Poles would rather leave the Union than accept refugees from Muslim countries, despite Poland’s legal obligation to take some in under the EU’s relocation and resettlement schemes. 79% of people also feel they are citizens of the EU, versus 19% who don’t. This is also above the EU average (71/28). Nonetheless, most Poles do not support adopting the euro currency. Since Poland’s EU accession, the country’s economy accelerated and transformed itself, creating social dislocations, which manifested most dramatically through the millions who moved abroad to escape high unemployment and (comparatively) low wages. However, Poland’s economic progress in the past decades has been remarkable and puts it among the fastest growing large economies with comparable levels of development. The country continued experiencing economic growth despite the global financial crisis, in part due to EU funding, since it is the largest beneficiary of cohesion funds. With a total GDP of €467 billion in 2017, it represented 3.6% of the EU-27 total (without UK). In 2018, the country was promoted to developed market status by FTSE Russel and classified as one of the 25 most advanced global economies. Between 2014 and 2018, Poland’s economy grew on average 4% per year, double the EU’s average (2.1%). While growth is expected to gently decelerate, with rates of 3.5% and 3.2% in 2019 and 2020, respectively, this is still more than double the EU average. However, Poland’s real GDP per capita was €11,800 in 2017, less than half the EU28 average (€27,700). In purchasing power standards, it stood at 70% of the EU28 average. Challenges to sustained economic growth mentioned by the IMF include increasing labour shortages (despite the large influx of Ukrainian workers in recent years), a shrinking working-age population and slow productivity growth. The labour market situation is reflected in the low unemployment rate of 3.9% (2018), way below the EU average of 7%. It is predicted to fall even lower to below 3% by 2020. Youth unemployment is higher (11.7%), although still below the EU average of 15.2%. The Third Polish Republic established Poland as a parliamentary republic, following its democratic transition (1989-1991), which was kicked off with the famous round-table talks, brokered between the Communists and the Solidarity-led opposition headed by Lech Wałęsa – who became the republic’s president between 1990-1995. 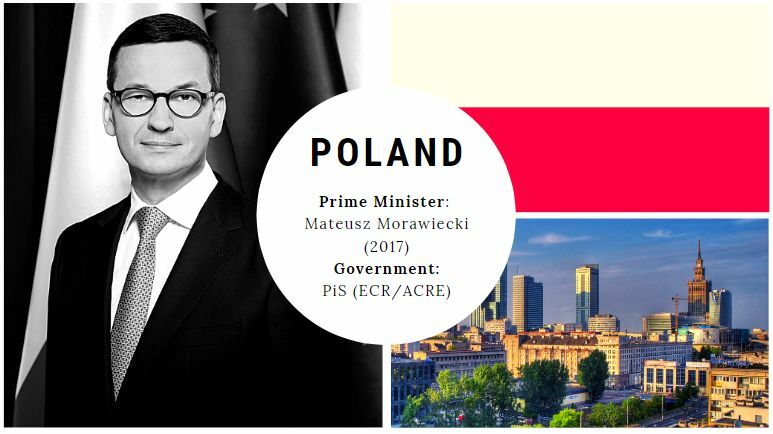 The prime minister (now Mateusz Morawiecki) is theoretically the most important political figure, serving as the head of government while sharing power with the president (now Andrzej Duda). In practice, however, as both of them belong to the ruling Prawo i Sprawiedliwość (PiS) party, it is party leader Jarosław Kaczyński who is said to exercise significant influence over policy decisions. Poland’s political landscape has been fragmented and volatile since its democratic transition. Solidarity, led by former Prime Minister Jerzy Buzek, made a comeback with the Akcja Wyborcza Solidarność (AWS) coalition that won 1997’s parliamentary elections. However, this coalition disintegrated in 2001 and lost its parliamentary representation. Nowadays, Solidarity is still active as a trade union, with a strong conservative agenda. The agrarian conservative Polskie Stronnictwo Ludowe (PSL) once delivered a prime minister (1993-1995). Usually obtaining around 5-10% of votes in parliamentary elections, its real power lies in regional politics – PSL has the largest number of members of all Polish parties, it also co-governs in eight out of the sixteen Polish regional councils. Another formerly dominant party was the post-communist centre-left Sojusz Lewicy Demokratycznej (SLD), which governed between 1993-1997 and 2001-2005, and was also the only party with a president (Aleksander Kwaśniewski) that served two terms (1995-2005). However, a high-level corruption scandal linked to the SLD dubbed the Rywin-gate made the party’s support plummet from 41% in 2001 to only 11.3% in 2005’s parliamentary elections, after which it further declined, before losing parliamentary representation in 2015. Nowadays, Poland’s main parties are the national conservative Prawo i Sprawiedliwość (PiS) and the liberal-conservative Platforma Obywatelska (PO). Both were created in 2001 and are rooted in Solidarity. They briefly formed a centre-right alliance and ran together in 2002’s local elections. However, they became rivals during 2005’s parliamentary elections and couldn’t form a coalition after jointly securing a majority. PiS went on to govern (2005-2007) over an unstable coalition – often criticised for centralising power and bending legislation in the government’s favour – with the national populist Samoobrona and the national conservative League of Polish Families. Snap elections were called and won by PO. PiS did keep the presidency (2005-2010), held by Lech Kaczynski, until his unexpected death in the Smolensk plane crash that killed 96 mostly high-ranking politicians, military top brass and others from across the political spectrum. The disaster continues to haunt Polish politics, mainly due to widespread conspiracy theories alleging Russian involvement. The crash has become a touchstone of PiS’s political identity and represents one of the factors behind the strong support for right-wing parties in the country. A PO-PSL coalition governed between 2007-2015 under Donald Tusk, until he became European Council President. It was the first coalition to govern for two terms. Nonetheless, this was marked by increasingly hostile rhetoric between the rival PO and PiS and led to further divisions in society. PO lost significant support following a scandal in 2014 which involved high-level PO politicians caught on tape discussing political favours bordering on corruption with central bankers and using foul and profane language. PiS profited from the PO’s troubles and managed to win 2015’s presidential and parliamentary elections with promised increases in social spending, undoing some of PO’s unpopular economic reforms and campaigning against the relocation of refugees across the EU. it was the first time a party gained an absolute majority in the Polish parliament, with just 38% of the vote, as several parties did not meet the electoral threshold. PiS subsequently pursued many controversial changes such as changing the law on the Constitutional Court, controlling public media, judicial and public administration changes, all of which have undermined democracy and polarised society. Relations with the European Commission and other member states became tense over the deteriorating state of the rule of law in Poland, due to which a rule-of-law procedure was initiated by the Commission (Article 7), as well as several infringement procedures. However, PiS remains popular primarily because of its social programmes. Moreover, PiS is supported by the Catholic church and the national television broadcaster TVP, which is openly pro-government. This comes despite the fact the government’s de-facto leader, Jarosław Kaczyński, has been embroiled in a corruption scandal himself this year. To challenge PiS, the opposition led by PO has managed to unite the PSL, SLD and several other small parties in a bloc dubbed the European Coalition (KE), which is set to contest the EP elections together. Another notable party is the populist right-wing Kukiz’15, led by former rockstar Paweł Kukiz, who surprisingly ended up third in 2015’s presidential elections and broke through in the same year’s parliamentary elections. It has positioned itself close to PiS and is considered its future ally, should the party lose its majority in the Parliament. A new challenger is the social liberal party Wiosna (Spring), founded this year by Robert Biedroń, a progressive former mayor of the northern city of Słupsk, who is attempting to establish his party as the serious third option in Polish politics. Biedroń runs on an integrationist, pro-EU agenda but often fails to provide details on his proposals. All major political blocs contesting in the European elections are stable. As so often in the past, the Polish campaign can be heavily influenced by possible publications of incriminating tapes of politicians. Despite the uniting of several opposition parties in the KE European coalition headed by PO, a recent poll indicates it might finish second with 39% of the vote, while the list headed by PiS should see its stable support vindicated with 41%. This would result in 24 MEP seats each. For PiS, 22 of these would go to the Alliance of Conservatives and Reformists in Europe (ECR/ACRE), unless a new, bigger Eurosceptic group is formed. The two other seats would go to two smaller right-wing parties associated with PiS, who are also likely to join a Eurosceptic grouping. In the case of KE, 19 of the 24 seats would go to the European People’s Party (EPP), three would go to the Progressive Alliance of Socialists and Democrats (S&D), one to the Alliance of Liberals and Democrats for Europe (ALDE) and one to the Greens-European Free Alliance (Greens/EFA). While Spring initially polled high, it has recently struggled to maintain popularity. Its potential national success would depend on its result in the EP elections, but in the current polls, it enjoys just 6% of support, giving it four MEP seats. It is unclear which European group it would join. Finally, there are many parties that poll below the 5% electoral threshold. Right now, only Kukiz’15 polls close (4.4%), and might still win representation. The outcome of the elections will have a strong reputational impact. A victory for the opposition could put KE in a comfortable position ahead of this autumn’s parliamentary elections, described by many as the most important ballot in Poland since 1989. PiS is also under pressure to perform well, as several ministers from its government are running to be MEPs – their bad result could be seen as a criticism of the government’s policies. It is also for this reason that the campaign is expected to be based on national issues, with politicians giving them a general European context. The performance of both Spring and Kukiz’15 would matter as well, particularly if they were to perform above the electoral threshold of 5%. Either of those parties could be key in granting either the KE or PiS the majority in this year’s national elections. Jan Szyszko – EU policy researcher and analyst based in Warsaw, publishing with In.Europa and Polityka.pl among others. Previously with Polityka Insight, graduate of the College of Europe and Trinity College, Dublin. Daniel Matthews-Ferrero is a Marie Curie PhD researcher in the POLITICO programme at the University of Aberdeen, focusing on contemporary Western European populism. He holds a Master’s degree in European Interdisciplinary Studies from the College of Europe. Alexandra Brzozowski is a Brussels-based reporter for EURACTIV.